When you walk in the front gate, you can get a map of the park as well as a daily entertainment schedule. I usually completely ignore the entertainment schedule, which is why this blog exists. Last time I was at the park I did pick up an entertainment schedule and looked for some kind of event that was going to happen within about 15-20 minutes of my arrival time. What can I say–I’m impatient. 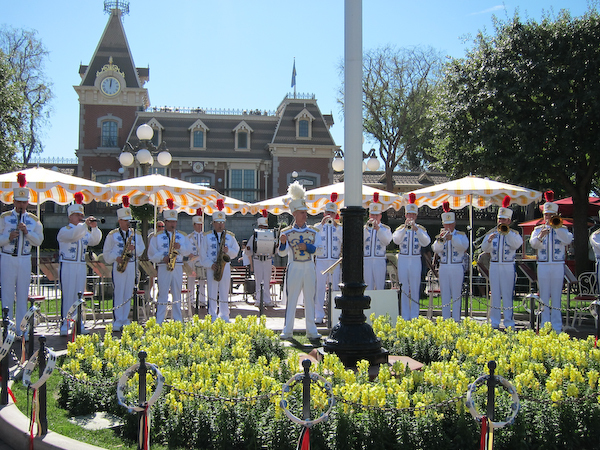 The first event that fit the bill was a performance of the Disneyland Band. The Disneyland Band is basically just like it sounds–a small group of musicians performing on Town Square on Main Street. The band marches in from the backlot dressed and playing instruments like a marching band, although their actual performance is seated. Apparently Walt really liked music (Fantasia, go figure), and wanted to bring music to the people or something, so he created the Disneyland Band when the park first opened and they’ve been there ever since. Talk about something I didn’t even know existed! Thank you, My Year With The Mouse! 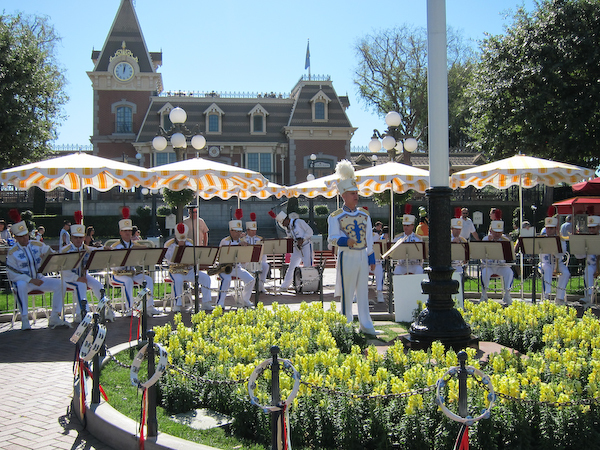 As the conductor explained to us, the Disneyland Band plays a series of songs based on a theme which changes every day. The day I was there, the theme was Dixieland and the music was all Dixieland-like. There were also tambourines around the flagpole and at a certain point in the performance you were invited to grab a tambourine and play along. I really wanted to do that, but Theo was getting grumpy and I also wanted to get some character pictures in, since the characters were also right there. So sorry, Disneyland Band–I ditched you in favor of Goofy and Chip. Yeah, I know this wasn’t very exciting, but I am determined to do everything here, so there ya go. Oh common, you don’t remember chasing the hunky college guys down all summer in 1990??? We totally followed the band everywhere around the park – didn’t know they exsist. Who are you – and what have you done to the Shelby I know??? Ha Carol, I KNEW you’d say that! That was the “All-American College Band” comprised of college students from all over the country, not the “Disneyland Band” (above) which plays only in Town Square and the main entrance. If the All-American College Band returns this summer, I’ll blog about them too. And for those of you not in-the-know, the summer of 1990, Carol and I (along with some other friends) ended up with a bunch of free tickets to Disneyland and spent the summer, as Carol describes, running through the park like a bunch of ridiculous crazed teenagers (which we were) tracking down the hot guys in the band wherever they would appear next. In retrospect, it was a little on the pathetic side. The Disneyland band is one of my favorite parts of our Thursday visits. They play a fun 15 minute show in front of the castle at 11AM, with five or six characters, then march down Main Street playing fun music. They stop in front of the fruit cart, half-way down Main Street for 8 to 10 minutes, and then again in front of the train station for another set. They come back out for the noon show, and then break into smaller musical groups like the Main Street Straw hatters, the Fire Station band and the Pearly Button band. Art Dragon is the leader of the band on most Thursdays and he is a wonderful trombone player professionally. He even teaches music lessons to the kids at El Dorado HS. Kurt is the leader of the band in your photo, and he is the leader of the Pearly Button Band with Mary Poppins. OH YEA! You’re totally right – my bad, sorry. Next time, just write in the disclaimer for me… 😉 (It’s been bugging me all day, what were those guys’ names??? (besides Woody, I’m friends with him on fb!). This was charming! I had no idea about the Disneyland Band (although I have recollections of the Straw Hat group Kelli mentions).